Advanced Web Ranking is a feature-rich and comprehensive SEO software that any serious online marketer should have in their tool box. Besides some of the more heavily used “go-to” features (ie keyword rankings and reports), one of my favorite functionalities is the Alerts feature… often overlooked, but a very powerful feature set. Within these three main alert categories, you can modify and customize the trigger conditions however you like. For example, instead of the default “outside of top 10”, there might be some critical keywords where outside of top 5 is important to you and you could set those parameters accordingly, same for visibility and positions conditions. Alerts are important and extremely useful because they will send notifications for SERP changes that can stem from a variety of issues. 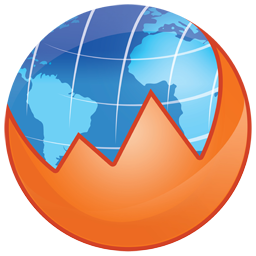 These may include structural or algorithmic changes relating to the search engine, technical issues on your site, or changes/updates from your competitors. Whatever the cause, alerts are essential to help assess damage and respond quickly to issues that might have a negative impact on your keyword positions and overall SEO performance. 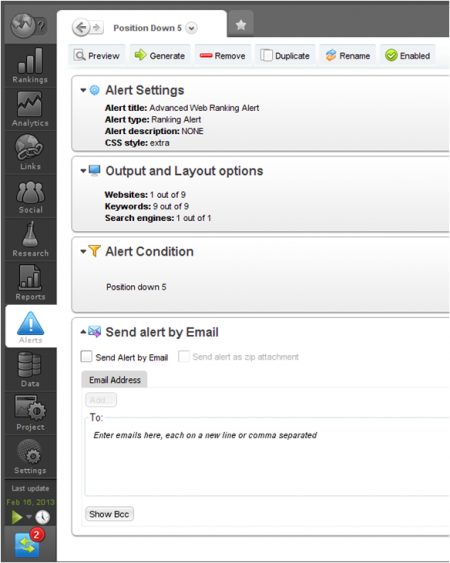 To get started with Alerts, simply click on the “Alerts” menu item and create a “New Alert” from the top pull-down menu. Here you can select your trigger conditions and apply them globally to the entire project if you like. If not, you can modify the conditions and select the alert data under “Output and Layout options” and select the sites or keywords specific for that alert. You can also create multiple Alerts and view and manage all of them with the Alert Manager as well as keep tabs on all of your alerts that have been triggered in the past with “Alert History”. If you aren’t already using Alerts already, now is the time to put this great feature into action.